The only thing worse than horrible back pain is trying to figure out why your back is hurting in the first place. When you wake up in the morning with sharp pains shooting through your back or are hunched over halfway through the workday, you begin to wonder what in the world you could be doing differently to avoid this exact moment. At Revelation Chiropractic, we focus on more than just providing you with the care that you need. To us, the revelation of life changes required to maintain a healthy back is something that we strive for on a daily basis. If you’re tired of wondering what could be causing your back pain, take a look at some of the most common causes of back pain. One of the most common causes of back pains stems from any accidents or injuries that you’ve experienced and haven’t received full care for, or may require additional attention. Whether it’s a car accident that you were in or an injury that you experienced while playing sports, these incidents lead to much more than the initial pain. Strained muscles and fractures are just a couple of the things that can happen in an accident or injury and lead to severe back pains. These types of injuries could require consistent work with your chiropractor before you feel relief of your back pain. It’s not easy to sit and stand straight, especially if you work a job that has you sitting for hours at a time. While countless new products are labeled ergonomic — there is still the conscious effort to sit taller throughout your day. If you aren’t currently using any ergonomic products while working at a desk or during your job that requires hours of sitting, we can help get you set up. Ergonomic products paired with knowledge of what works best for your body during a work day will ensure that you’re taking good care of your back. Aside from tools that are ergonomic friendly, it’s essential to have your routine adjustments done so that you can continue to maintain a healthy posture. Stress is one of the reasons that people experience back pain, as if there was any need to dislike stress more than we already do! Similar to how stress can affect your weight, an overload of stress can also take a toll on your back. The tension that builds up when stressed will start to collect in your back, which is what leads to that discomfort that feels good when released in a massage or after a good night of sleep. When you pile depression or anxiety on to the tension that the stress is causing, you are more likely to experience severe back pains or have the pain for extended periods of time. The best thing you can do here is treat yourself to care tactics that also relieve your body of that tension. Good examples of this would be massages, adjustments, and any self-care tactics that you enjoy. Back pain is something that is associated with pregnancy, but what it’s due to is the weight gain that your body was not prepared to carry. For that reason, pregnancy, weight gain and being overweight can cause back pain. If this is a reason that you’re experiencing back pain, there are tools that you can use to help make life more comfortable. One of the best suggestions that we can make is incorporating a workout that helps strengthen your back while also helping you get to a healthy weight. The more consistent that you are with this, the more likely you are to eliminate any back pain that you may be experiencing. 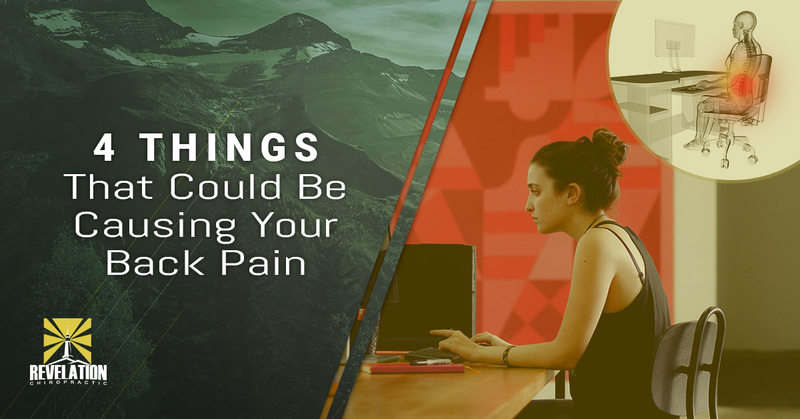 There are so many different reasons that you may have back pain, but the little things in your day-to-day life may have a more significant impact than you realize. When you’re unsure of what may be causing your pain, you can always schedule an appointment or stop by our office. As we said before, we are driven to empowering our patients with the knowledge that they need to enhance their lifestyle. Call and schedule an appointment today!